May brought more stable weather to the Golden Isles of Georgia, as well as the first good set of tailing tides of the year. 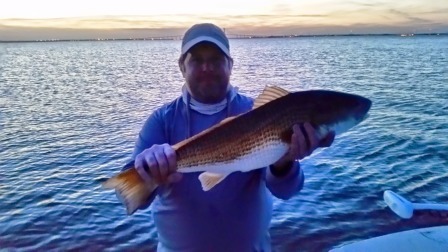 Chris came down from Charlotte to enjoy sight fishing to our big, tailing red fish. As the tide came in, the tails popped up. Chris cast to at least ten tails before we found this fish. We must have chased it 400 yards before Chris finally put a Black Toad (click to be taken to the recipe on my web site) in front of the fish. As soon as the fly landed, the red fish inhaled it. After a ten minute fight, we released him to fight another day. Chris ended his vacation in Beaufort fishing with Capt. Owen Plair, out of Bay Street Outfitters, hooking and releasing a Broad River cobia. Chris's first on the fly. More Daddy/Daughter days. Bill and Kate came out for a few days fishing. We first tried tailing red fish. Kate had a few shots at tailing fish, and had one attack her fly, but she did a trout set, and didn't seal the deal. A few days later, we got together to do a little trout fishing. Kate and Bill caught a bunch of trout, and Kate had a ball. May is the best time to sight fish for floating triple tail with a fly rod. 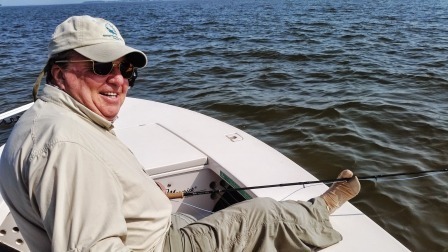 I had the pleasure of fishing with Tony Royal, Owner of Bay Street Outfitters and his good friend David Cargile (pictured with his fancy sun socks.). These are two excellent, experienced fly anglers. We only had a few shots that day, and they managed to spook several fish by placing the fly on top of them. A fine time was had by all, and I look forward to fishing with these gentlemen again. In early June, I fished with Darrell and Amy from Oklahoma. Darrell had been practicing fly casting. He managed to put a Prawn's Revenge (click to be taken to the recipe on my web site.) right in front of this triple tail. The TT is not very big, but any triple tail on a fly is a great fish. Low tide sight fishing for red fish can be challenging in the summer. Jake made the best of it, with this nice 21" upper slot red, caught and released in early June. 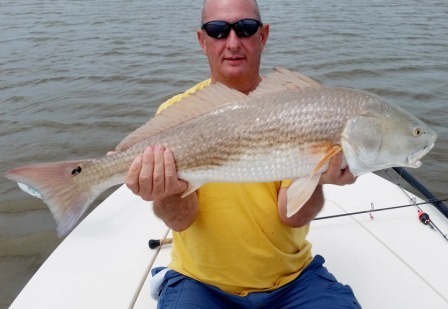 Robert came to the Golden Isles, and managed to boat this nice 10 lb red fish. 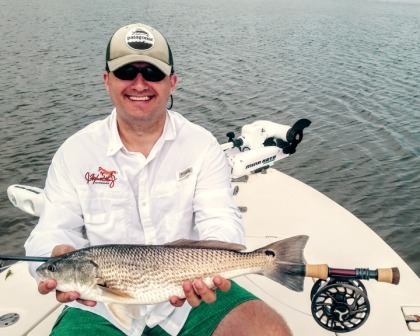 Fishing for tailing red fish in the grass is what most people consider the classic way to fish for red fish with a fly rod. There is nothing more exciting than poling a flooded grass flat trying to choose which red fish to try to catch. Morning flood tides are best. I have already booked a lot of trips, and only have a few days left for these tides. September: 1st, 2nd, 3rd . We will continue to sight fish red fish on the low tides. If you have some flexibility, it is best to fish the low tides in the morning. The earlier the better. Water temperatures get higher in the afternoon, the wind comes up and the fishing is more difficult. We will have some great fishing for red fish in early fall on the flood tides. (See above for available dates.) We will have some fishing for tailing red fish in the evenings this summer on the full and new moons. If it is available, I will be sure to let you know. Trout fishing will get better and better as the summer goes on. Right now, the best fishing is on the beach on Cumberland Island. 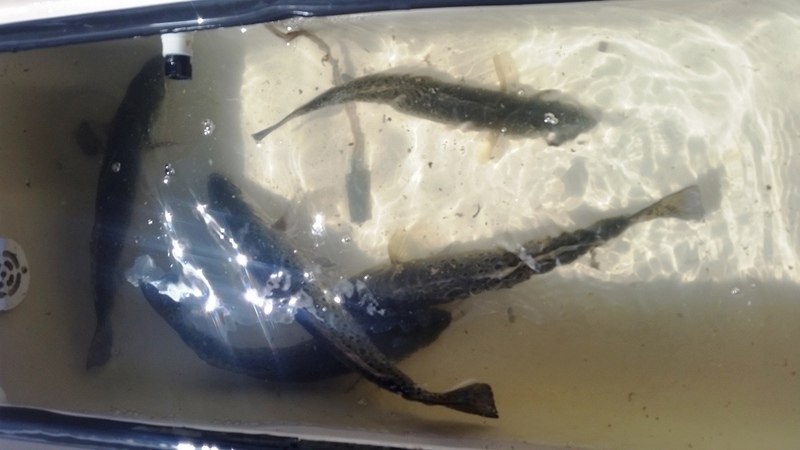 Oyster drops inshore will become more productive as the summer progresses. I have been doing more blind casting for trout this year, and we have been having some luck. We have also caught several flounder while fishing for trout. They are hard to pattern, but these fish are here now. I will have an 11 weight fly rod on the boat, and we will look for them, as well as Tarpon, whenever we are on the water. If the opportunity presents itself, we will be ready, and you will have a chance to hook a fish that pulls like a Mac Truck. 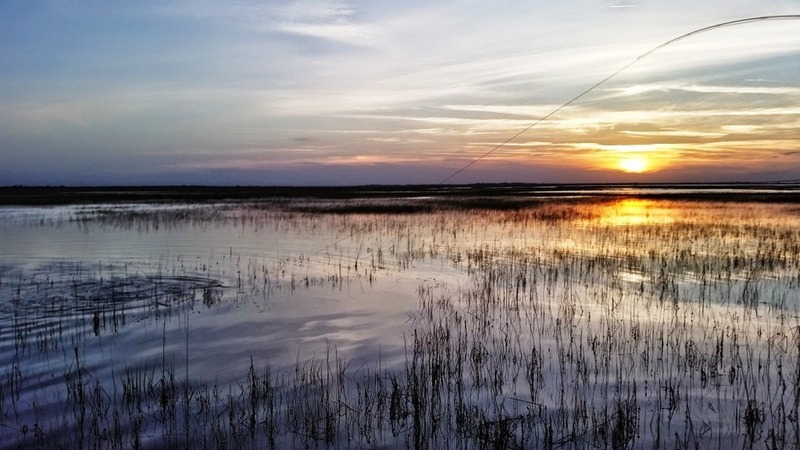 "Hunt Fish in the Marshes of Glynn"
Live well full of nice trout. Great for dinner. 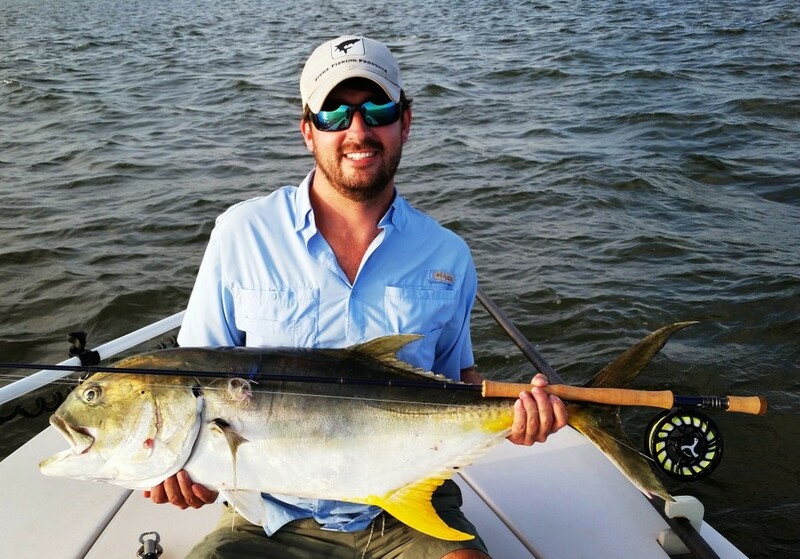 A huge Jack Crevalle caught last year. 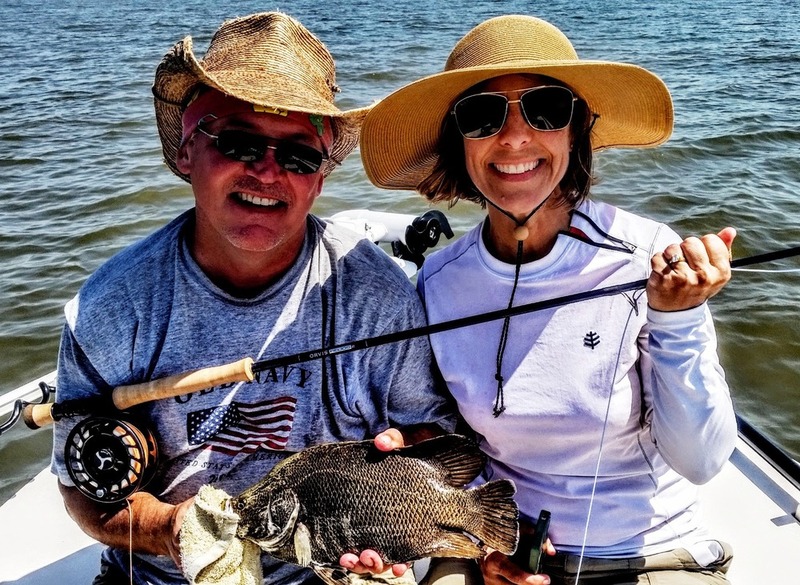 This is just some of the alternatives for summer time fishing in St. Simons. 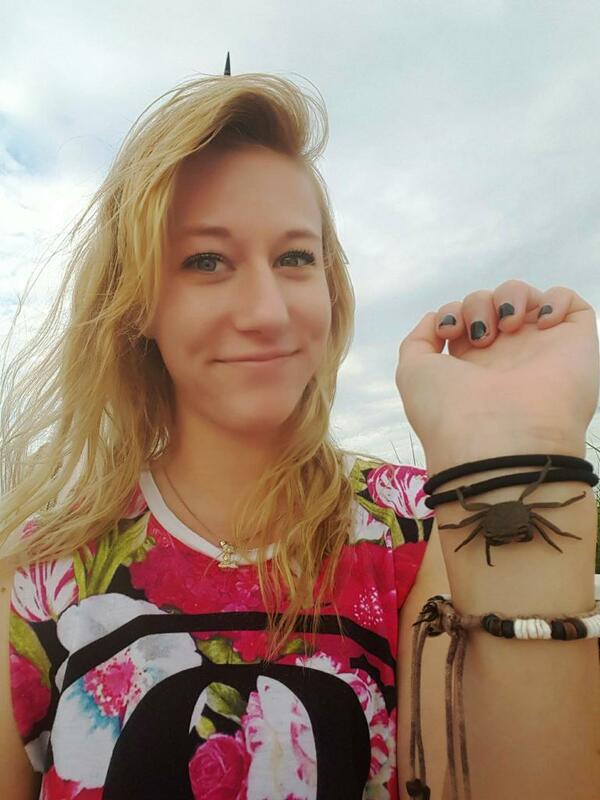 Sometimes when the fishing gets slow, my clients start adopting fiddler crabs. 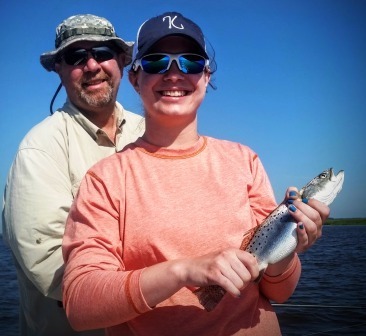 This young lady fished with her Dad, Steve. She is starting college this Fall majoring in Marine Biology. Daddy/Daughter trips are really special.